CubeX P13.3 3D printer professional, we spend so much time to investigate like and unlike 3D printing machine, We use all update technology including LCD panel and stereo lithography(SLA curing resin process). We find improvement. From beginning, we know our aim is best user friendly and easy operate,multiple function LCD SLA 3D printer. CubeX achieved this aim, our CubeX is really plugin and plugout 3D printer in present market. 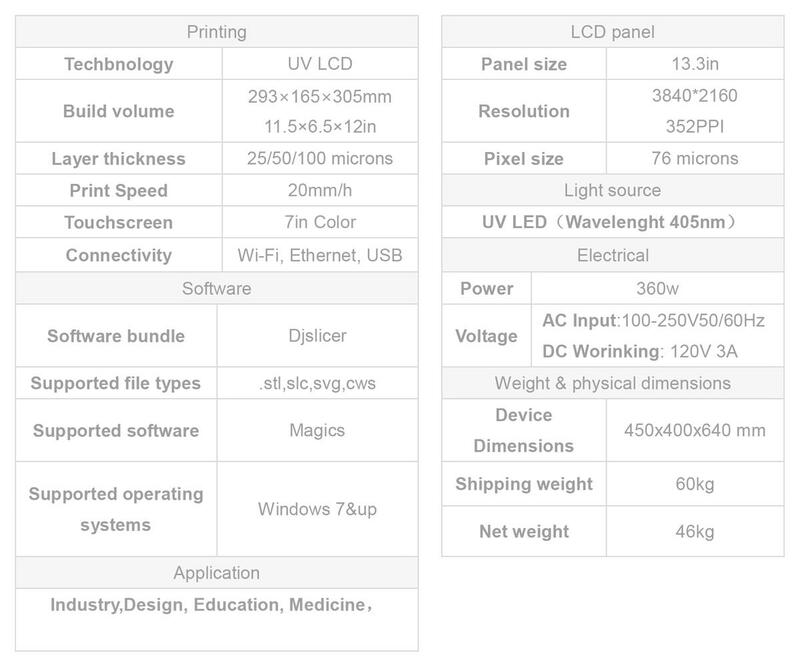 Super large forming size,WiFi control and remote printing. Exclusive patent for vertical parallel UV light source.Higher molding accurac. 1.This machine works with these software input formats: .stl, .obj, .amf ? Works with .stl but I have never used .amf and I usually convert to .stl when I check the mesh when using .obj,you can convert to what is popular formats. 2.I would like to know if is bivolt? The printer essentially uses a laptop charger. It takes in 100-240v and converts it to 12volts at 6 amps.